Successful power distribution asset management is vital for all electro-sensitive and electro-intensive industries. And companies are now under more pressure than ever to manage these assets sustainably. While different industries’ interpretation of the term “sustainability” varies, the definition generally includes the 3 pillars of sustainability: Environmental, economic, and social. For industries to become more sustainable, and to maximize the total cost of ownership (TCO) of assets, they need to leverage maintenance strategies and digital technologies with a focus on maximizing production levels, optimizing maintenance budgets, and reducing unscheduled downtime. The good news is that proactive maintenance strategies can now take advantage of digital technology services that are specifically designed to address asset performance management. These could become an important component of overall asset management programs and help boost sustainability. Services like this can provide a dashboard that permits a nearly real-time view of the state of a company’s electrical assets, enabling smarter decision-making. Digital technology, for example embedded sensors and prediction engines, provides key insights into operations by overseeing asset performance, sending notifications about asset degradation, and recommending actionable maintenance information. Service bureau experts can facilitate remote troubleshooting by providing guidance to a customer maintenance technician, as well as helping remotely fix equipment problems. This saves companies both time and money. 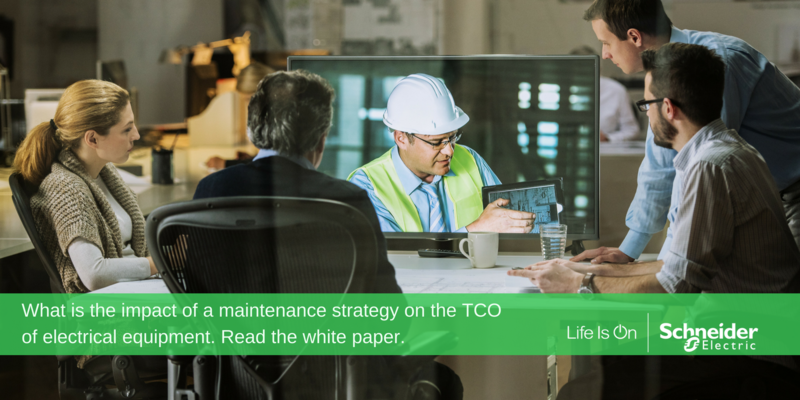 Implementing maintenance strategies helps companies protect their assets and obtain maximum value from them by extending their assets’ lives and increasing energy efficiency through wear and tear reduction. Maintenance minimizes downtime and the risk of undesired, unplanned events, and facilitates more efficient spare parts management. Let’s review the spectrum of maintenance strategies. Remember that the appropriate type of maintenance depends on the equipment being maintained. Reactive maintenance: Reactive maintenance is straightforward—assets are allowed to run until they fail. It’s typically used on either non-critical assets or when it is not possible to conduct preventive maintenance, for example if there isn’t an appropriate shutdown period. Preventive maintenance: Preventive maintenance’s aim is to prevent asset failure and costly repairs by performing regular maintenance and inspections. This should reduce costs and improve productivity. The maintenance schedule is based on factors such as manufacturers’ recommendations or the number of units in use, without previous investigation of the equipment. Condition Monitoring: Though not a category of maintenance type itself, condition monitoring is the process of systematic data collection and evaluation (sometimes continuous) to identify changes in performance or conditions of a system, or its components, such that remedial action can be planned to maintain availability. Preventive maintenance schedules can therefore be adapted to asset conditions. Predictive maintenance: Techniques like condition monitoring and continuous monitoring can be designed to help determine the condition of in-service equipment in order to predict when and what maintenance should be performed. Further, digital services designed to optimize asset performance management can be bundled with some equipment manufacturers’ service plans to provide even further peace of mind. The push toward sustainability in all areas of business will continue. Forward-thinking companies can take a proactive approach to more sustainable asset management by embracing this new digital technology to improve their maintenance strategies. Learn more in our white paper, Electrical Distribution Maintenance Fundamentals, or see our service brochure.